Reserve A Romantic Retreat Today! My wife and I have been booking with Cabins USA for many years. We have always been treated with respect . Your company and Staff are simply awesome, Thank You for All you do .. The cabin was nice and exactly what was advertised. The only thing is that it needs updated couch in the cabin. This was a great property for my family! Great location, great price, & very comfortable! Will return! Everything was really great! The only “fault” we really found from the place was the large amount of spiders around the hot tub area. We went to Walmart and bought a can of bug spray to spray the walls of the porch and the railings down with because there were a lot of spiders. The only recommendation we could give is to have an exterminator spray or something. We understand that you can’t elminate all bugs and spiders because outside is outside, but it could’ve been a little bit more under control than it was. Other than that little fault, our stay was absolutely amazing and we plan on booking the same cabin for our next stay! We had a great time in Gatlinburg while staying at A Romantic Retreat. Perfect small cabin nothing fancy but everything we needed. From previious reviews we knew there was no deck furniture. We packed convenient chairs in a bag and they worked perfect as the deck was narrow and didnt allow anything larger. Hot tub was small but easy to get in and out. Note to anyone pulling trailer the entry is a luttle steep and the parking is limited and gravel. The staff at check in was fast and friendly. The cabin was neat and clean. The hot tub on the deck was amazing. I only had 2 "complaints" on the room. The bed had no headboard and was up against a window which was very uncomfortable for me and there were no chairs on the deck. Even though there was no mountain view sitting on the deck would have been nice and relaxing. Overall the cabin was good, clean and I would definitely recommend to anyone looking for something close to all the main attractions. We will use Cabins USA again next year for our stay! We love this cabin! This is our 3rd time staying here for our anniversary and we will be coming back! Perfect location, super close to downtown but yet very secluded. Small cabin, but perfect for a couple! Our only issues were minor, the shower in the bathroom, be forewarned, the plumbing is switched. Hot is actually cold and cold is actually hot. Not a major deal, but it’s quite the shock when you think you are hopping into a nice hot shower! Also we had a terrible odor of sewage outside of the house. (Not inside, thankfully!) I know the property is probably on a septic tank and it had been raining the entire time we were there, but the smell outside when we would come and go was pretty terrible. It wasn’t something that effected our stay or comfort though, as we could not smell it in the house. We will definitely be back to this cabin, it’s our favorite! This was a nice, clean little cabin. It just right for what we were looking for in price and location. Now the view on the other hand, not so much. I love staying here every time we go to Gatlinburg we will stay at the Cabins USA the place is so clean comfortable. We loved it all! We just wish there was a place to do a bon fire. It was a great romantic time for our anniversary. I was expecting more of a mountain view, but being close to the city, yet far enough from the traffic was also very nice. Great! This cabin was close to town yet out in the country. If you do not need much space and do not mind a neighbor it would be perfect for you. The cabin is perfect for a nice getaway. The only things we weren’t completely satisfied with was the mattress. Definitely needs to be replaced. And a couple of chairs on the deck would be very useful. Otherwise we were very pleased. We checked in on Dec 11 and to our pleasant surprise was a beautiful REAL Christmas tree! It had beautiful lights and ornaments on it. Made for a very romantic getaway along with the fireplace. THANK YOU whoever it was to put up the Christmas tree for us!!! We enjoyed our stay!!! Will definitely come back! The cabin and location were great. We only had one issue and that was our problem with the tv. We could not figure out how to change stations and with 3 remotes it shouldn't have been a problem. Otherwise the stay was very nice and the bed was so comfortable. Thank you for taking the time to let us know about your recent stay in A Romantic Retreat! We here at Cabins USA strive to give each of our guests the best stay possible while vacationing in the Smokies. I apologize for the issues you experienced with the televisions. Your comments have been forwarded to our maintenance department to be addressed. When you are ready to stay with us again, please mention you are a return guest for an additional discount. Thank you again for your review and thank you for choosing Cabins USA! It was very cozy n clean. If you are tired of driving up that mountain then this is the place for you. Only a mile from the parkway. Very satisfied. I am so happy to hear that you enjoyed your stay in A Romantic Retreat! We here at Cabins USA strive to give each of our guests the best stay possible while vacationing in the Smokies. When you are ready to stay with us again, please mention you are a return guest for an additional discount. Thank you again for your review and thank you for choosing Cabins USA! Thank you for all of your kind words! We here at Cabins USA work hard to make sure each of our guests have the best stay possible while vacationing in the Smokies. Thank you for choosing Cabins USA and we look forward to seeing you again soon! Very enjoyable vacation. The cabin was very comfortable and very convenient to local attractions. The only issue we had was the handle on the back door was broken, but we notified the office and hopefully it has been repaired. We have stayed with USA Cabins for the last 3 years, and we will continue to stay with you! Thank you for all of your kind words! We strive to give each the guest the same great stay you experienced while vacationing in the Smokies. Thank you for choosing Cabins USA and we look forward to having you as our guest again! cool off before attempting to get in. It was small and not very deep, but would have been great; had we been able to get it cooled off. Overall thou, the cabin was great. This was our second time renting with Cabins USA and we will definitely be using ya'll again. I am so happy to hear that you enjoyed your stay in A Romantic Retreat! We here at Cabins USA work hard to make sure each of our guests have the best stay possible while vacationing in the Smokies. I apologize for the issues you experienced with the hot tub. Your comments have been forwarded to our maintenance department to be addressed. Thank you again for your review and thank you for continuing to choose Cabins USA! Showerhead needs to be replace. Showerhead was more like a faucet running then a showerhead spraying water. The king size bed mattress needs to be replaced. It was like sleeping on springs. The sofa slept better than the bed. Also no Wi-Fi or cable the entire time we were there. The cabin itself was great. The carpet was stained and dirty looking. The bed was uncomfortable. The couch was stained and had holes in it, very uncomfortable. The coffee table was about to fall to pieces. The thermostat was not working right. Needs a tall gate for hot tub for privacy. But all in all we had a wonderful time. Was a very good honey moon for my daughter and her husband. They enjoyed the cabin and the area very much. Already looking forward to going back. Thank you for all of your kind words! We here at Cabins USA work hard to make sure each of our guests have the same great stay you enjoyed while vacationing in the Smokies. When you are ready to stay with us again, please mention you are a return guest for an additional discount. Thank you again for your review and we look forward to seeing you again soon! Couch was very used. Needs to be replaced. Also the coffee table needs to be replaced. Very wobbly! Thank you for taking the time to let us know about your recent stay in A Romantic Retreat. We here at Cabins USA work hard to make sure each of our guests have the best stay possible while vacationing in the Smokies. Thank you for letting us know about the couch and coffee table. Your comments have been forwarded to our Owner Liaisons and they will be bringing this to the owner's attention. When you are ready to stay with us again, please mention you are a return guest for an additional discount. Thank you for choosing Cabins USA and we look forward to having you as our guest again! First time using a cabin. Very satisfied with the location and the cleaniness of the cabin. Comfortable, quiet and really romantic. Thank you taking the time to let us know about your recent stay in A Romantic Retreat! We here at Cabins USA work hard to make sure that each of our guests have the same great stay you enjoyed while vacationing in the Smokies. When you are ready to stay with us again, please mention you are a return guest for an additional discount. Thank you again for your review and thank you for choosing Cabins USA! We stayed in A Romantic Retreat over the weekend and it was wonderful! Very cute little cabin. Everything was so beautiful and clean, very clean. Perfect for the romantic weekend getaway we wanted. Definitely using Cabins USA for our family vacation. I would recommend Cabins USA to anyone! Thank you for all of your kind words! Our cleaners work hard to make sure that each of our cabins are thoroughly cleaned and fully stocked so all our guests have to do is walk into their cabin and start relaxing. When you are ready to stay with us again, please mention you are a return guest for an additional discount. Thank you again for your review and thank you for choosing Cabins USA! Staff was very helpful and friendly. ...we had a great time and will stay again. nice cabin, enjoyed our stay. we have used Cabins USA several times. the outside of cabin is dirty with lots of cob webs. our back door looks at someones property/house. we had showed up at 5:10pm, maintenance man was still there, which was inconvenient for us? All things /concerns should have been addressed prior to our stay. I really enjoyed the time there and the cabin for the most part was clean. It wasn't until I went to leave and looked under the couch for my keys when I saw cheetos left by the previous guest. Everyone was helpful especially when I forgot my key number one night, thanks for the help. I have already recommended your property to friends who may be interested in going to the area. Thank you for taking the time to review your stay with us. We are delighted that you had a great time. We do apologize for the issue you found with the cleanliness. We have turned that over to our head of housekeeping to insure it is addressed and does not happen again in the future. We appreciate your recommendations and we hope to hear from you again soon. Thank you so much for your kind review! We here at Cabins USA work hard to make sure that each of our guests have the same amazing stay that you did! Please feel free to contact one of our reservationists if you would like any help in planning your next trip to our area. They are always more than happy to help our guests find the perfect cabin. Thank you again for your review and thank you for choosing Cabins USA! Romantic Retreat cabin is a very cozy one bedroom cabin. It is located a bit too close to a main road & had no view nor chairs to sit on the porch. (We had beautiful weather while there in March, but had to leave the cabin to sit outside & enjoy the weather!) The rear of the cabin faced a private home; it was missing a small pan in the kitchen, & the bedroom closet door was missing numerous slats. The floor corners of the bedroom had not been cleaned for a long time, & there were spider webs in the shower area. Both the TV's worked well & the sofa & king bed were comfortable. The next time we go, we will be sure & ask for a cabin with a view as well as seating outside on the cabin's porch. The cabin was cute but not too cozy. The bed was very hard, the carpet was dirty and stained and the TV in the bedroom did not work. There were several spider webs around the cabin and it really needs a good cleaning. We liked the convenience to the main stream of things to do, shopping and restaurants. It was easy to get access to the cabin with a car on the smooth gravel road right off the highway. It was quiet which was nice. I would have liked it better if the ivy was not crawling up the cabin with lizards crawling up the side and the spider webs needed knocked down above the jacuzzi! It was a pleasant get away and we enjoyed it! Thank you for your review. We are glad that you enjoyed your stay with us at A Romantic Retreat. We apologize for any inconvenience you may have encountered during your stay with us. We appreciate your feedback on your stay, and we will have our inspector address the ivy around the cabin. We hope that we hear from you again soon. This place was very nice! Parking was tight for a full size truck. But over all we liked it. Really enjoyed my stay. The staff are very friendly and very accommodating. Reserving the cabin was very easy and so was check in. I would highly recommend Cabins USA to everyone, visiting the area. I will stay with Cabins USA everytime I travel to the Smokies. We really enjoyed our stay in the Romantic Retreat cabin with Cabins USA. Everything was great!!!! We celebrated our first anniversary there, it was a great choice!!! We definitely will be staying again!! Had only a VHS player. That's very generic when you can buy a DVD player for twenty dollars. Come on man. Great for a couple with just enough room and space. Has all the ammenities of a hotel with the privacy for more relaxation and rest. Close enough to all the attractions, yet tucked away for making you feel as if you are away from the hustle and bustle of the parkway. Easy to manuever the back way into and around the parkway without traffic hurdles and lights. Highly recommend and will be staying again in this one when come down without family. 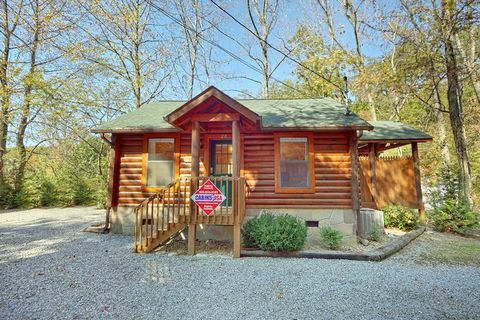 This is our 4th rental with Cabins USA. Location is almost next door to the back of Dollywood. 3 of us stayed at this small cabin. There were plenty of towels, etc. Floors were sticky and needed cleaned better. Ice trays were cracked. Could use a few more dishes, including pizza pan. The first night a roach ran across my wife's pillow and she was pretty uneasy about sleeping in the bed. I always want a hottub to relax in, but was disappointed with this one. The temp was very low when we got there, needed a better cleaning, and had very few jets, only got in it once. All the other cabins I have rented had gas grills and this one had a state park style charcoal grille (didnt bring charcoal) that was underneath a cedar tree (that is highly flammable) and less than 10 feet from the couple of hundred gallon propane tank, this really needs looked into and remedied. Hard to receive WI-FI on hand held devices. Never ran out of hot water and washer/dryer worked well. What a great and helpful staff. We had an amazing time! House was great but hot tub did not work. The staff at cabins usa was great to help us out with that issue which we greatly appreciate!!! Thank you for choosing Cabins USA. We are happy to see that you enjoyed your stay. We do apologize for the inconvenience regarding the hot tub, but we are happy that it was taken care of for you. We hope that you will stay with us again soon. Had a slight problem with check-in, due to the fact we didn't get a key/code or map to the cabin and it was after hours. Thankfully, we finally found a phone number that worked and we were able to get into the cabin. Also, was not as secluded with residents living directly behind the cabin. Other than that, nice stay.